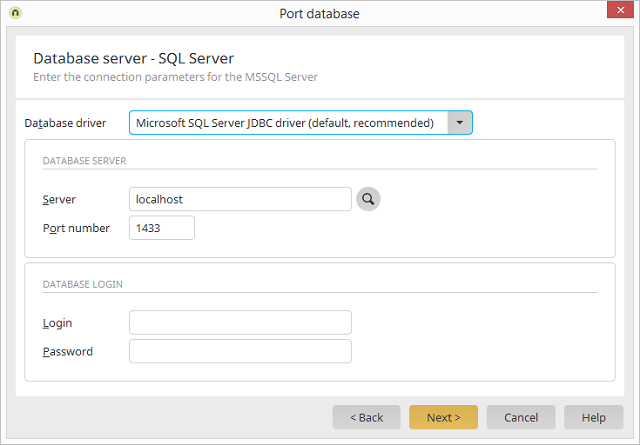 Create new portal General / Continue to Database server Database server / Select Microsoft SQL Server/MSDE / Click on "Next"
Portal menu / Portal properties Database / Port database Database server / Select Microsoft SQL Server/MSDE / Click on "Next"
Select the corresponding driver here. Enter the server name or IP address here. Opens a dialog where the server can be selected. Enter the communication port of the database here. Enter the username and password for the database here.